Oh on certain days how I wish I was lounging on a deck chair on any one of the Disney Cruise Ships. This recipe brings back memories of magical desserts and warm ocean breezes. 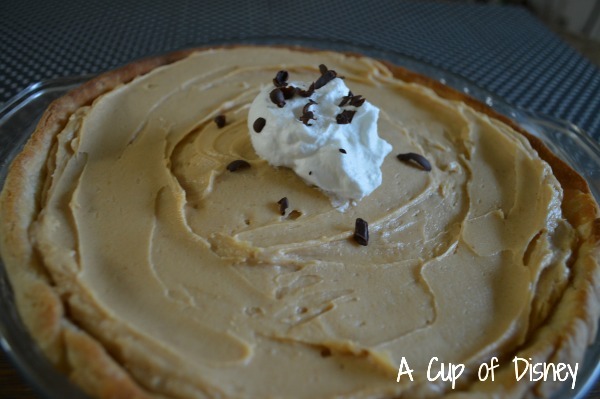 It is so easy to make and will satisfy your sweet tooth, especially if you love peanut butter. With an electric mixer with a whisk attachment, add the whipping cream and beat until stiff peaks form, transfer to another bowl and put aside. Once again with an electric mixer with a whisk attachment, mix the peanut butter, sugar and cream cheese until blended together smoothly. Add the melted butter to this mixture, then fold in the whip cream as well. Pour into the baked pie shell and chill in the fridge for one hour.